We’ve been spending a lot of time this summer with the Old Testament. We’ve looked at Proverbs and Ecclesiastes. We looked at the First Commandment. We talked about the sign of the rainbow. We read the story of Balaam and his talking donkey. This morning, let’s go back and look at a funny story with a serious point. I’d like us to take a look at the book of Jonah. Everybody knows Jonah was the guy who swallowed a whale. Is that right? No. I’ve got it backwards. It’s probably the biggest fish story of all time. Almost nobody believes the story of Jonah — at least, not the way that we believe in some of the other, more historical parts of the Bible. Jonah is what I would call a “tall tale”, sort of like the Bible’s answer to Paul Bunyan or Jack and the Beanstalk. Except that it has a very serious point. Most people who think they know the story of Jonah and the whale don’t really know the serious point the book is making. But Jonah ran away from the Lord. He headed for Tarshish. So he went down to the port of Joppa. There he found a ship that was going to Tarshish. He paid the fare and went on board. Then he sailed for Tarshish. He was running away from the Lord. But the Lord sent a strong wind over the sea. A wild storm came up. It was so wild that the ship was in danger of breaking apart. All the sailors were afraid. Each one cried out to his own god for help. They threw the ship’s cargo into the sea. They were trying to make the ship lighter. But the men didn’t do what he said. Instead, they did their best to row back to land. But they couldn’t. The sea got even rougher than before. Then they cried out to the Lord. Then they took Jonah and threw him overboard. And the stormy sea became calm. The men saw what had happened. Then they began to have great respect for the Lord. They offered a sacrifice to him. And they made promises to him. Now the Lord sent a huge fish to swallow Jonah. And Jonah was in the belly of the fish for three days and three nights. Some of you have heard me say before that what you call a story makes a lot of difference to how you understand it. Most of us tend to refer to this as the story of Jonah and the whale. I think that it makes a lot more sense to refer to this as the story of the Reluctant Prophet. Now, there’s something you’ve got to understand about Ninevah in order for this story to make any sense. Ninevah was the capital city of the Assyrian empire, which at that time had conquered the entire Middle East. The Assyrians were not nice people. They were the bad guys. They had a habit of going through and killing everybody in town after a city had surrendered. The Assyrians invented horrible tortures to inflict on people. This is not propaganda. The Assyrians’ own pictures show rows and rows of people being impaled on spears after they were captured. The Assyrians in their day were like ISIS in our day. Everybody hated them. Everybody was afraid of them. So, we have to picture God telling Jonah to go up to Ninevah. It was sort of like one of us being told to go to Tehran or Damascus, waving an American flag and singing Yankee Doodle. Jonah had a pretty good idea of what would happen to him if he tried this. So, Jonah took off! Instead of going to Ninevah, which is in the Middle East, Jonah got on the next boat out to Tarshish, which was in what we now call Spain. God said go to this way, and Jonah promptly headed that way, in the exact opposite direction. Jonah took off to the other end of the known world. Jonah forgot that wherever he went, that God would be there, too. So God sent this great storm, and the boat that Jonah was on started to sink. Everybody on the boat was scared out of their wits. They threw the cargo overboard, to lighten the ship. They prayed to all of their assorted gods. And they went around asking whose fault it was, that the storm had come upon them. Meanwhile, Jonah had gone below and was sound asleep. Probably he was exhausted and seasick. Anyway, the captain grabbed Jonah by the scruff of the neck, dragged him up on deck, and told him to get busy praying to his God, whoever his God might be. The sailors, who were were all really superstitious, decided to draw straws to see who was to blame for the storm. When they pulled Jonah’s straw, it was the short one. And a delegation of great big, hairy bos’un’s mates went to Jonah to see what it was he’d done. Jonah said that it was all his fault, and that God – who made the heavens and the earth, not to mention the sea, which was about to drown them all – God was very angry at him, Jonah. So Jonah volunteered to be thrown overboard in the hope that God would let the rest of them live. And they didn’t want to do it. These pagan sailors, these guys who didn’t know the God of Abraham, Isaac, Jacob and Moses, they didn’t want to give Jonah the old heave-ho. These pagans were horrified at the idea of taking a human life. And so they tried their best to row the boat to land. But it didn’t work. The ship was starting to break up into driftwood. So they all prayed to Jonah’s God, who they’d never heard of before. And they tossed Jonah overboard into the drink. And Jonah prayed a very long, beautiful prayer down there in the dark, in the belly of the fish. If you really want to know, Jonah plagiarized the words for his prayer straight out of Psalm 88. But, hey, when you’re cooped up like that in the belly of the whale, you can’t be too creative. And then God said, “AHEM – arise, go to Ninevah, that great city, and proclaim to it the message that I tell you. . .” God didn’t say anything about the fish, or the storm, or about what might happen to Jonah if he tried taking off again. This time, Jonah didn’t argue. So, off Jonah went, in the right direction this time. He didn’t drag his heels. He didn’t make any little side trips to Myrtle Beach or Blowing Rock. Jonah goes right to Ninevah, which for the sake of exaggeration they describe as being bigger than New York or Atlanta, maybe with Tokyo tossed in. And Jonah, who by this time must have figured that he was a goner anyway, dutifully proclaims the word of the Lord. He walked through town, saying, “Forty more days, and Ninevah will be torn down!” That’s all. It was the shortest prophetic message in the whole Bible. Then, the really unexpected thing happens. They listened to him! Every man, woman and child in Ninevah, from the king – who you’ve got to remember was a really bad guy – everybody from the king on down, everyone listened. And they all repented. And God decided not to destroy the city after all. Jonah was fit to be tied. He said it was bad enough to be sent out on a suicide mission, smelling like fish barf. But Jonah went into a conniption, when they listened to him, after all, and they repented. And Jonah stomped on out of town, and he pitched his tent out past the suburbs. He was hoping against hope that God was going destroy Ninevah anyway. He wanted God to do a Sodom-and-Gomorrah destruction number on the city. Jonah wasn’t going to miss all the fireworks! And overnight, God made a tree grow up over Jonah’s tent, to shade it. And since it was a pretty hot August, and they were on the edge of the desert, the tree made a lot of difference. Jonah was grateful. Next day, God sent termites, or cutworms, to eat up the shade tree over Jonah’s tent. And God sent a howling desert sandstorm over the ridge. Jonah’s tent collapsed, and Jonah himself was about to collapse from heat stroke. So Jonah got angry all over again at God, who you’ve got to admit had been giving Jonah a pretty rough time. I always like that last line, “and many animals.” God cared about them, too. Anyway, there’s a lot going on here. First point. Notice how the pagan sailors and the horrible Ninevites are pictured as being more willing to turn to God than Jonah, the prophet who runs away. This theme is something we see in a lot of Old Testament stories. Balaam, the foreign prophet, discovers that it’s impossible to curse or to hold back anything which God has blessed. Ruth, the foreign woman, is the one who is faithful, and who restores the inheritance of her husband and re-builds the relationship with his people. Today, it’s the pagan sailors and the awful Ninevites who pray and who repent. I think that we can legitimately say that there’s a message here. It’s like Jesus’ story of the Good Samaritan, only more so. People who are not part of “God’s people” are sometimes more faithful, more discerning, and more responsive than we are. Sometimes you find unbelievers who act more like Christians than we do. It’s enough to make you think, and maybe we’re supposed to. Second point. Notice Jonah isn’t even allowed to escape what God wants him to do by dying. Jonah volunteered to be thrown overboard. He figured it was better to be drowned, than to face the terror of letting the Assyrians torture him to death. But God didn’t let Jonah off the hook. God pursued Jonah to the end of the earth. Maybe God wanted the Ninevites to change. But maybe God wanted Jonah to change. Maybe God wants us to change, too. Third point. Notice that God managed to accomplish what God had intended all along. Even if God only gets the grudging cooperation of a guy like Jonah, God can do amazing things. If God has our whole-hearted cooperation instead, just imagine what could happen! What could God do, if we went along with God’s plan, without fighting it or ignoring it? If God really wants peace, then why do we make so many excuses for war and violence? If God really wants forgiveness, why are we so slow to forgive? Why do we hold back in our hearts? What could God do, if we cooperated fully, right from the beginning? Fourth point. It’s easy for us to understand why the fish threw up Jonah. He was such a sour personality than he’d give anyone indigestion. Fifth point. The story of Jonah is one of the most important stories in the Bible, to understand our own condition, in times of distress. 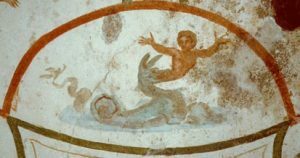 If you look at early Christian art, you’ll find that Jonah is one of the most popular early Christian images. In the art of the early Christian church, the themes we find most frequently are Daniel in the lion’s den; Daniel and his friends in the fiery furnace; the disciples, tossed around by a storm, in a tiny boat, out in the middle of the ocean; and Jonah, praying from the very place of death, in the belly of the fish. Those images are where the early Christians saw themselves. When early Christians tried to draw pictures of themselves, the story of Jonah was one of the ones they used most. The reluctant prophet, running away from God, being carried through disaster, to proclaim the word of God in the face of enemies, discovering that God was already at work in the hearts of those “enemies” – that is the story of Jonah. And that’s the story which we are invited to discover as our own. The story of Jonah is not about a whale. It is a story of reluctant faithfulness. It’s a story about a prophet who’s goosed by God. The story of Jonah is God saying, “You can run, but you can’t hide.” God never lets us go. God uses every possible means, even miracles. to bring us home. But Jonah also makes it clear that God is not interested in revenge, or in destruction. God didn’t really want to destroy Ninevah. God is not in the punishment business, even when there are awful people around. Jonah says that we cannot flee from the power of God. But it also says that we cannot hide from the mercy of God, from the redeeming love of God. God’s love is a pursuing love. God chases us down, in the darkest places imaginable, in the very face of despair and death. And God sends us off, to proclaim the eternal, impossible message of love and redemption. Great sermon. Sorry I missed in person. I was at the beach with my son Ryan, his wife Elizabeth, and, of course, grandsons, Isaac, Wyatt, and Levi. This sermon gave me a new perspective of the story of Jonah and I loved it.